I peeled myself out of bed at the cold and dark hour of 5 am today. Lots to do. Bear to needle felt, mohair to dye, cake to bake, patterns to make... The self employed artist's day never lacks variety, only hours to get it all done. By 10am I was able to tick a few things off the list, congratulating myself for being on schedule for a change. Then a peculiar movement caught my eye and my heart stopped. Colani was dragging himself along the studio floor by his front legs. Every once in a while he would try to get up and fail, giving a weak whimper. 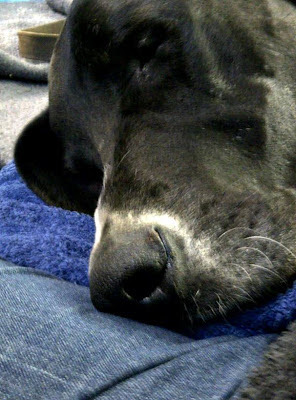 My beautiful 65kg great Dane was paralyzed. Just a few hours earlier he was romping around on the lawn with all the other dogs. Ruptured discs in Danes is not uncommon, it's incurable and one of my great fears. Needless to say, all work stopped and we prepared to rush to the vet. We had to muzzle Colani to prevent him inadvertently biting one of us when we move him. Traumatic for me and the dog. After slipping a rug under him we were able to lift him into the car and a very tense journey followed. Following careful manipulation of his hind legs, the vet suggested that we lift Colani out of the car and see whether he could stand up. There a miracle happened. The dog walked away! Panic and adrenalin will often make an animal ignore an injury. In this case though, it means that whatever the problem is, it is not spinal, or he would not have been able to walk. For the next few days we are going to try homeopathic anti inflamatory tablets and monitor his condition carefully. The vet feels confident that he will recover. I'm sure you can imagine my relief. I feel a bit like someone who dreamt that I was falling off a cliff, just to jerk awake at the last moment. Here's Colani sleeping with his head in my lap in the car on the way home. Both of us exhausted. I am emotionally drained, and I've decided not to continue working on Ross tonight. The mood has to be right to do something so creative. I did make him a set of perky ears today. And I dyed the fabric for the first Ross workshop. Attila and Monet did quality control. Tomorrow we have a felt play day in the studio and I will be devoting time to some other small projects I have on the go. Most likely this will help me settle down too, and I will get back to Ross the day after. I know your sense of panic. Our furry children are so precious and when they are ill it hurts in your heart. Thankfully Colani has no spinal injury. You both should take a nap this afternoon, and just cuddle with each other. Thank you Joyce, Colani is much better. I am watching him closely!